Many dental offices welcome children, but Alexandria Pediatric Dentistry was designed exclusively for kids! Dr. Lopez has the training and experience to give children, teens, and patients with special needs the specialized care they deserve. Quality preventive care is especially important for children, because most serious dental problems can be avoided with routine cleanings. We recommend bringing your child in when his first tooth erupts, or no later than his first birthday. Positive dental experiences during childhood set the stage for a lifetime of healthy smiles. We go out of our way to make kids’ dental visits stress-free, and we offer laughing gas and gentle sedation options for our more anxious patients. Welcome to Alexandria Pediatric Dentistry! Our mission at Alexandria Pediatric Dentistry is simple: We make dental visits fun for kids and easy for parents. We’ve tailored our practice to address children’s unique needs for treatment and care, because we know that kids of all ages can feel nervous about dental visits. From the toys in our cheerful reception area to the cartoons above our dental chairs, every detail has been designed to help children feel completely at home in our office. We invite you to explore our website to learn more about Dr. Lopez and the comprehensive dental services we provide here at Alexandria Pediatric Dentistry. If you have any questions or would like to schedule an appointment for your child, please give us a call or send us an email! We look forward to meeting your family and taking care of you for years to come. We are conveniently located on the second floor (Suite A) of 3223 Duke St. in Alexandria, VA. 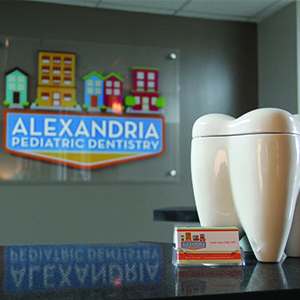 Need directions to our Alexandria pediatric dental office? To make an online payment, please click below and register. Once registered, please enter our office location statement code MW7WDR and make your payment.